The LUX Hydroxyl System provides outstanding cleaning and disinfection, while significantly lowering utility costs. The LUX technology supercharges in-house laundry systems through Hydroxyl radicals. Hydroxyls are more stable at lower temperatures, reducing the need for hot water by 85%, or in some cases, eliminating the heating of laundry water altogether. The LUX Hydroxyl system is designed to work in tandem with OMNI Solutions biodegradable laundry products, working best in cooler water temperatures, reducing energy consumption, lowering utility costs, and resulting in significant sanitation and disinfection efficacy. According to the World Health Organization, UV is the best available technology for addressing the world’s most demanding health issues related to effective disinfectant cleaning solutions with maximum energy efficiency. OMNI Solutions supercharges your in-house laundry system, providing the LUX Hydroxyl System at no cost. Utilizing a safe, UV light bulb the LUX Generator turns room air into earth’s strongest natural oxidizer: Hydroxyl radicals. 500 times more powerful than hot water and bleach, the system achieves outstanding bright whites, and helps keep linens softer than traditional chemistry. One sixty-pound capacity washer with the LUX System could save more than 5,820 therms. At the national average cost of 65 cents per therm that saves $3,783.00 of natural gas per year. 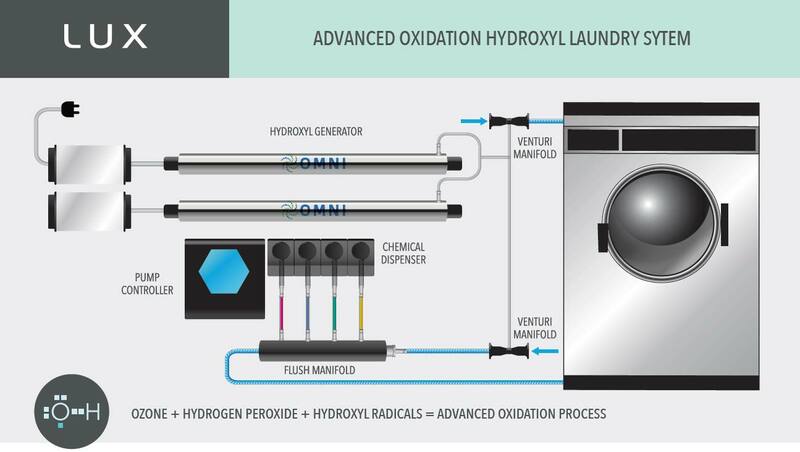 The OMNI Solutions LUX Hydroxyl System provides savings throughout the laundry by significantly reducing dry times. By injecting Hydroxyl radicals into the wash, the need for alkaline-based chemicals is lowered. This reduces the buildup of calcium in linen fibers, allowing sheets, towels and blankets to release water faster in the washer extraction phase, and in the dryer as well. Without all the calcium, fibers in the linen are less stiff so textiles stay softer and more comfortable. The savings in dry time is 10% or more, providing an annual reduction of over 1,225 therms of natural gas for a 165,000 btu/hour dryer. 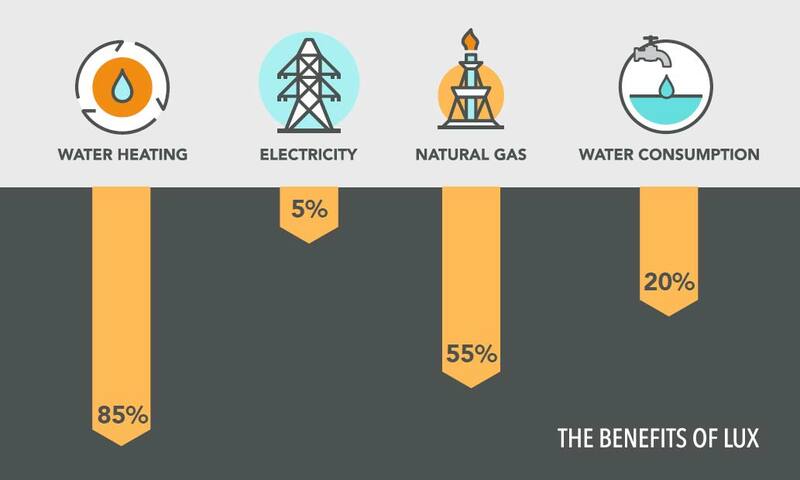 Cutting natural gas costs and reducing the laundry’s carbon footprint is just the start. Most washers have factory programmed wash formulas for different types of linens and soil levels. A facility may use nine or more different cycles, and higher than necessary water levels. With the LUX Hydroxyl System providing outstanding cleaning and disinfection, OMNI Solutions’ technicians are able to reprogram the wash cycles and reduce the complexity of formulas, lowering water and chemical consumption. Average annual water conservation is over 100,000 gallons per 60 lb capacity washer.